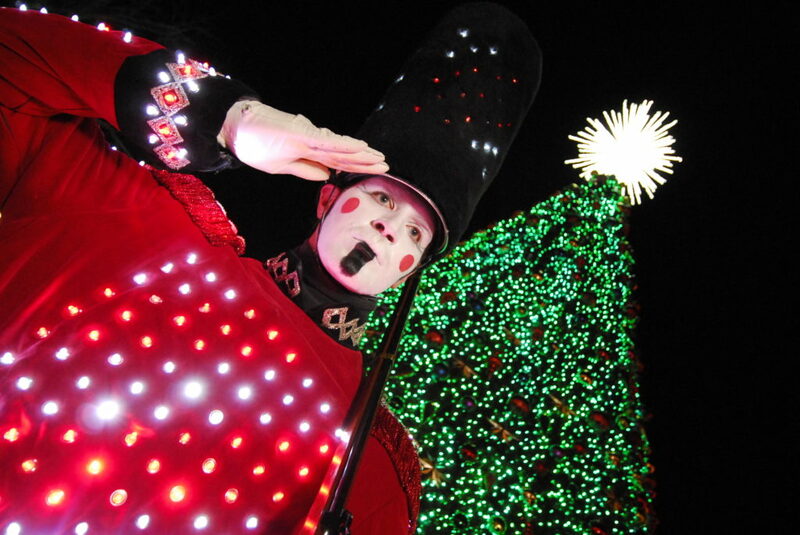 A Toy Soldier leads the Light Parade at Silver Dollar City. 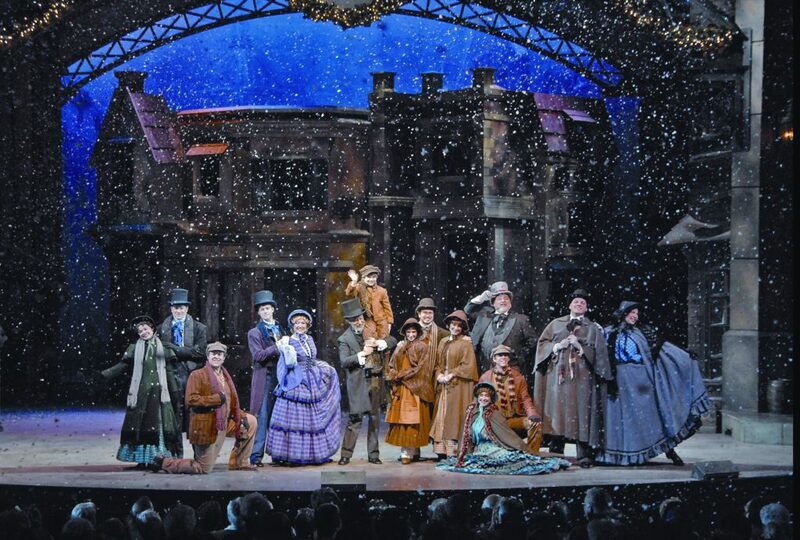 Snow falls on the cast members of the Broadway-style musical, A Dickens' Christmas Carol, at Silver Dollar City. I’ve been writing travel articles ever since I had my very first weekly column, The Student Traveler, in my hometown Illinois newspaper when I was a teenager backpacking in Europe. Since then, I’ve been published in over 70 different newspapers and magazines, including Woman’s Day, Chicago Tribune, Cosmopolitan and Travelworld International. My website is nancypistorius.com. Welcome to my first Daytripper column, a brand-new monthly feature in Go! Lawrence stores have been decorated with mistletoe and holly for weeks, but now that Thanksgiving Day is almost here, it’s really time to get in the mood for a little holiday magic. And I can’t think of a nearby (less than 4 hours and 20 minutes drive) location with more Christmas spirit than Branson, Missouri’s Silver Dollar City. It’s easy to get there from Kansas City: Just take U.S. Highway 71 South to Harrisonville; then Missouri Highway 7 South to Clinton; Missouri Highway 13 South from Clinton to Springfield; and U.S. Highway 65 South from Springfield to Branson. On your way into town, be sure to stop at Lambert’s Café (“The Only Home of Throwed Rolls”) in Ozark, Mo. Hearty meals are served in a fun atmosphere, complemented by “pass-arounds” continuously brought to your table by servers — fried okra, fried potatoes, macaroni and tomatoes, black-eyed peas, and sorghum and honey. Oh, yes, and those famous “throwed rolls,” which come sailing through the air at regular intervals, while customers try to catch them. Once you’re in Branson, you might want to make Still Waters Resort on Table Rock Lake (right next-door to Silver Dollar City) your home base, especially if you have kids. Although it’s probably too nippy this time of year to enjoy the outdoor pools, kayaks and paddle boats, the lake view is still gorgeous, and your family will have plenty of room to spread out in a condominium, with a full kitchen so you can even prepare breakfast for your picky eaters. The Hilton Branson Convention Center, close to the shops and restaurants on Branson’s Landing, is another great option, with its upscale accommodations and friendly service. Probably your best entertainment option, if you only have a day or two, is Silver Dollar City’s “An Old Time Christmas.” Prepare to be dazzled by 4 million lights as Silver Dollar City rolls out its brightest season ever, through Dec. 30. The theme park rides are still in full-steam throughout the 100-acre park, but at night the whole area is transformed into a winter wonderland, with more than 1,000 decorated Christmas trees and a musical, five-story Special Effects Christmas Tree that twinkles and dances in incredible synchronization (6,000 light changes per minute) to Christmas carols. The Gifts of Christmas Holiday Light Parade glides through twice each evening, and special Christmas shows include “The Living Nativity,” “Frosty!” and “A Dickens’ Christmas Carol,” a Broadway-style musical production. Satisfy your hunger for all the tastes of the season at Silver Dollar City — turkey and dressing, hot wassail and gingerbread cookies — and then learn new holiday recipes at Silver Dollar City’s Culinary & Craft School. You can check some goodies off your Gift-Shopping List, too. One hundred demonstrating craftsmen throughout the park create one-of-a-kind holiday items, from blown-glass ornaments of angels and snowmen to Scotch pine-scented candles. Elsewhere in Branson, Christmas shows abound. Legendary crooner Andy Williams has created and produced a brand-new Christmas show at the Moon River Theatre, with special guests including the Lennon Sisters, and a musical tribute to Frankie Valli & the Four Seasons. The Branson Variety Theatre offers up “Hollywood’s Christmas Spectacular,” and Tony Orlando’s “Great American Christmas” is in full swing at the Welk Resort Theatre. Orlando is still a dynamo. Two different drive-through light displays — The Shepherd of the Hills Trail of Lights and Branson Area Festival of Lights — will fill you with holiday cheer. You can also cruise into Christmas aboard the Showboat Branson Belle, bedecked with holiday garlands, enjoying world-class entertainment on Table Rock Lake while tucking into a delicious three-course meal. Whether you come for a day trip or a weekend getaway, you’ll leave with precious family memories.